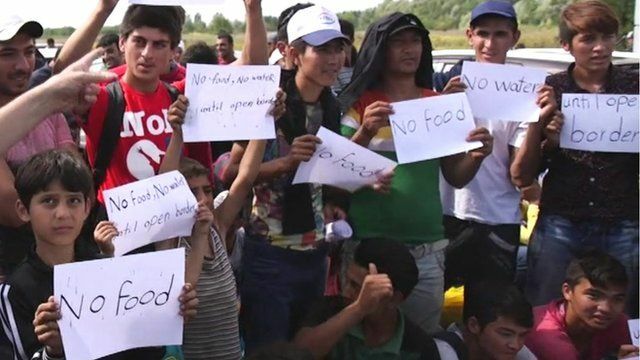 Border protest: 'No food, no water' Jump to media player Migrants who have been stopped at the Serbian border have started to protest at not being allowed to cross to Hungary. Migrants enter Hungary at new crossing Jump to media player A new border crossing has opened between Serbia and Hungary for migrants wanting to cross into Hungary. Hungary 'blocks' railway migrant route Jump to media player Christian Fraser reports from Hungary's border with Serbia as Hungarian police block a key crossing for migrants. BBC reporters divided by border fence Jump to media player Christian Fraser and James Reynolds report from both sides of the Hungarian-Serbian border where Hungarian security forces have blocked off an informal crossing point for migrants. Migrants rush to beat EU border deadline Jump to media player Security is being tightened along the frontiers of more European Union states in response to the number of refugees on the move. Emergency talks on refugee crisis Jump to media player The Organisation of Islamic Cooperation will hold an emergency meeting in the Saudi Arabian city of Jeddah on Sunday to discuss the Syrian refugee crisis. Migrants who have been stopped at the Serbian border have started to protest at not being allowed to cross to Hungary. Some people were holding up signs reading "No food" and "No water", in what appeared to be a hunger strike. Hungary declared a state of emergency in two southern counties as tough new laws to stop migrants entering illegally came into force. Police said they had arrested 60 people accused of trying to breach a razor-wire fence on the border with Serbia.